Once upon a time, in 2010, there were two big powerful All-American left tackles from the Big 12. One went to Oklahoma, one went to Oklahoma State. One was drafted with the #4 pick, the other with the #6. One drafted by the Washington Redskins, the other by the Seattle Seahawks. Fast forward to 2012 and those two men are both Pro Bowlers. They are both in the playoffs. They are both in the NFC. One on the East Coast, one on the West Coast. They each protect fast & exciting rookie quarterbacks. And on Sunday, their teams will face each other in the NFC Wildcard Game. In 2010, as the Redskins were getting amped up over their new shiny quarterback Donovan McNabb. The organization was dead set on trying to find someone to protect this investment over the next several bountiful years. And while we all know that Trent Williams turned out to be the guy (and McNabb turned out not to be the quarterback), the Redskins were very interested in Russell Okung. Okung visited the Redskins before the draft and, according to his agent, the top-ranked (in many circles) tackle had a very good visit. It was looking like Russell Okung would be protecting Donovan McNabb's blindside. But Mike Shanahan and his zone blocking scheme ranked the more athletic Williams a little higher and scooped him up with the 4th pick. 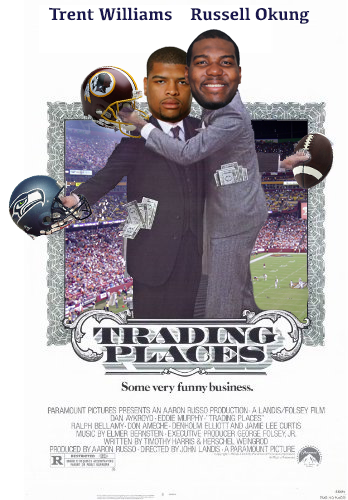 But it is interesting to consider what would happen if we could go back in time and pull a Trading Places bit with Trent Aykroid and Russell Murphy. Would their careers have ended up as serendipitous as they have? Would their respective teams be facing off this Sunday?